Can You Outdrink Your Friends? Of course, we all know how much fun it can be to tip back a few adult beverages at parties and other social events, but have you ever wondered “What exactly is alcohol doing to me physically/mentally, and how bad am I hurting my overall current/future health?” These thoughts begin to cross our minds as we get on in years, but also because the amount we need to consume tends to increase as we begin to drink more, and more, because of a developed tolerance to this poison. Yes, alcohol is a legal poison. A poison which so many Americans are proud to drink, no matter what it begins to cost them. They can lose their friends, families, careers, health, and general respect due to this terrible epidemic afflicting so many people, and not just in the United States, but many other countries as well. 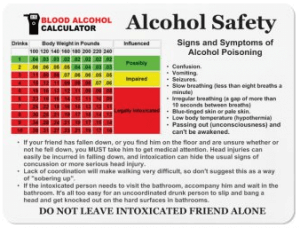 Many people who consume alcohol regularly build up such a high tolerance, they don’t appear to be intoxicated at all. This is one thing that can be very dangerous, especially if that person decides to grab their keys and get behind the wheel of their vehicle. They could potentially hurt themselves, or worse, an innocent bystander. Could you imagine awakening from a drunken stupor only to realize you’ve killed an innocent person? I know I couldn’t, and I’m not even speaking of the frighteningly serious involuntary manslaughter charges I’d be facing in front of a judge and jury. Take a second the next time your friend “looks okay to drive”, and actually, add up the amount they’ve consumed. If it’s over the limit, take that friend’s keys away. You may save someone’s life, but also set an example and show everyone you’re a true friend. 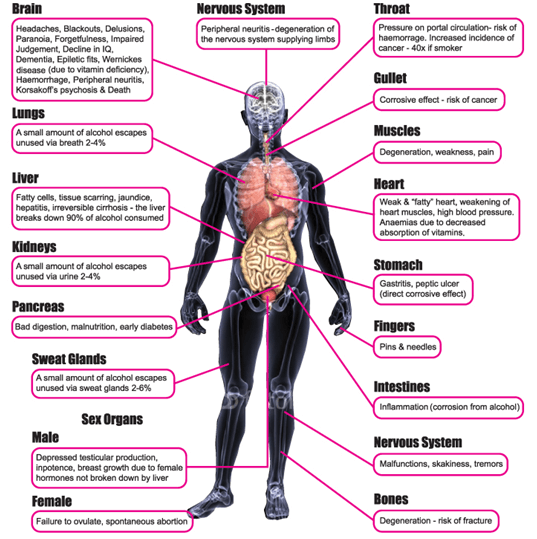 Alcohol effects so many different aspects of our health which can make a person question if it’s even worth starting drinking in the first place. It literally damages almost every part of your body in one way or another. For men, it can significantly lower your sperm count, making it difficult to start a family. Women suffer fertility issues as well due to their inability to ovulate, or worse, the misfortune and heartache of a spontaneous abortion caused by drinking too much alcohol. Alcohol can be damaging to almost every aspect of our lives, that is, only if we let it. It’s absolutely fine to have the occasional drink or two out with your friends, or unwind with a nice Cabernet or Shiraz after a long day at the office. It’s when you begin drinking in abundance you should maybe reevaluate the reasons you’re drinking to begin with. Most of the time it’s for reasons you don’t fully understand, and that’s partially due to the dependency that’s taken hold of you. A dependency you and so many others didn’t see coming. Don’t let alcohol become your crutch, because it can be incredibly difficult to release that crutch from your grasp.